TCS is a trends management program. The data can be field data, coming from one or more acquisition systems of a net and/or internal performance data of servers. In a general way the program can manage every kind of values, stored and periodically updated, in a Data Base which can be reached form the computer where the program runs, via SQL queries through the opportune drivers (ODBC and/or BDE) . It can be useful to follow the trends of data mainly over a long period of time and to store important data for successive review. It can be useful also to follow the relevant parameters of a server to control and optimize the performances in peak activities periods, as can be a sustained alarms period in a supervision system. The data can be displayed, stored, printed and exported either in graphical form either in numerical form. The program include spreadsheet functions. It allows to visualize, in one single page or in multiple pages, different trends graphics. Every graphic can display a maximum of 6 curves. The maximum number of points data the program can manage is 10,000. The trends can be visualized on hourly, daily, weekly, monthly and yearly basis. 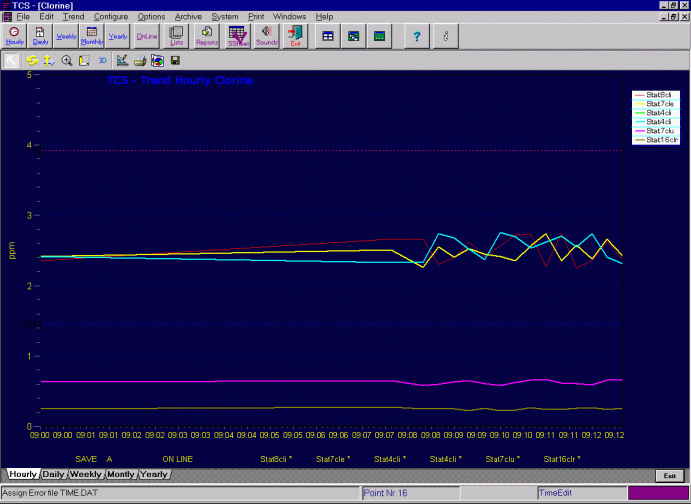 The graphics display the points values, as they are coming from the field for the hourly trends, while the other graphics report, on selection, the arithmetic average or the weighted average (hourly average for daily and weekly trends and daily average for monthly and yearly trends). The weighted average is based on the time interval between an upgrade and the next . The data can be only visualized or also memorized in a historical archive.